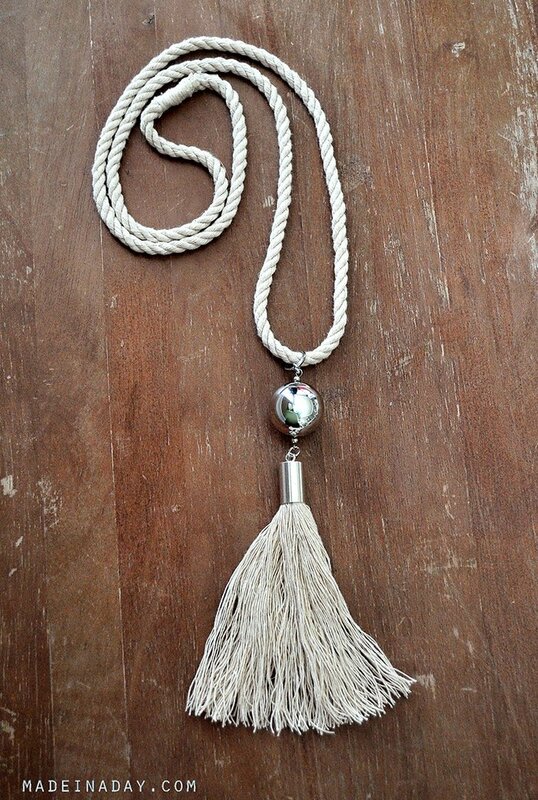 Looking to add style to your plain old tassels? 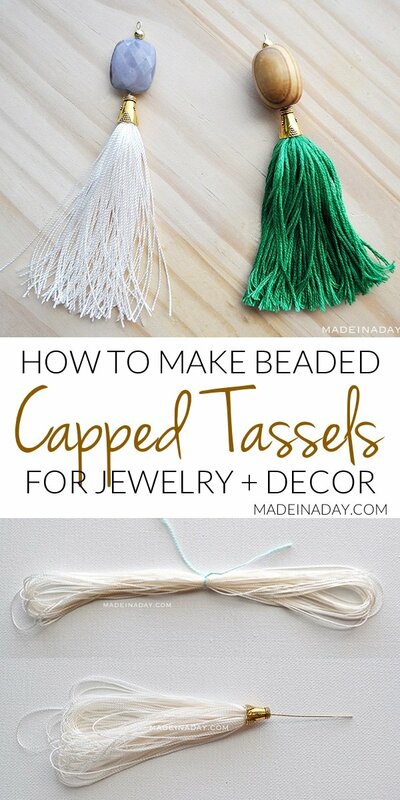 Try these DIY Capped Tassels. 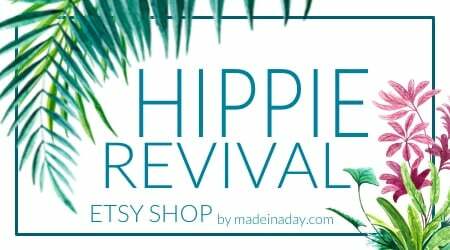 Great for beaded tassel necklaces and other jewelry. 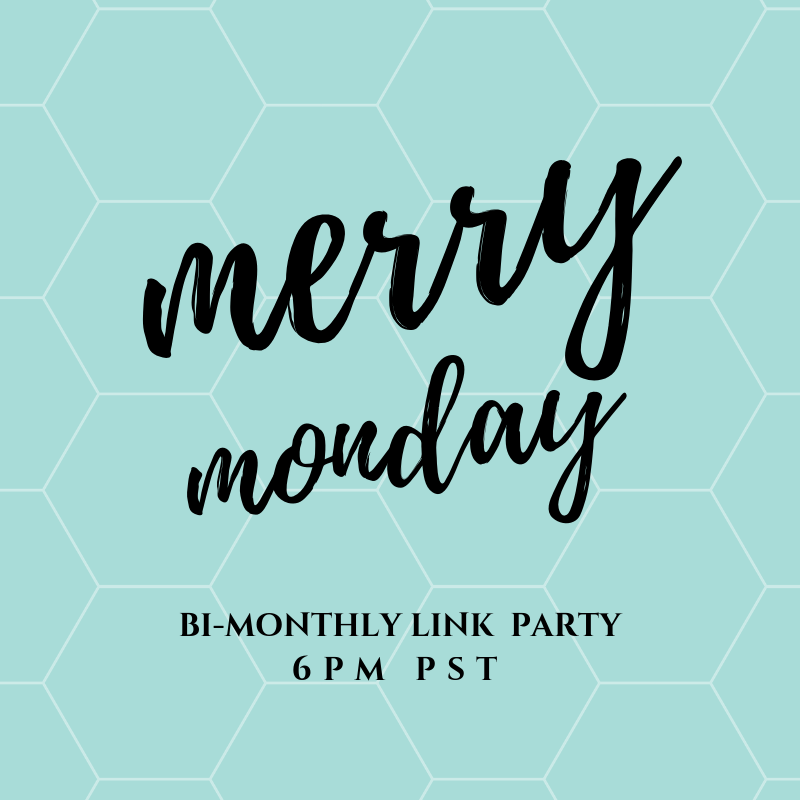 See more of my fun jewelry on my Fashion and Jewelry page. Well, I have gone tassel crazy again. 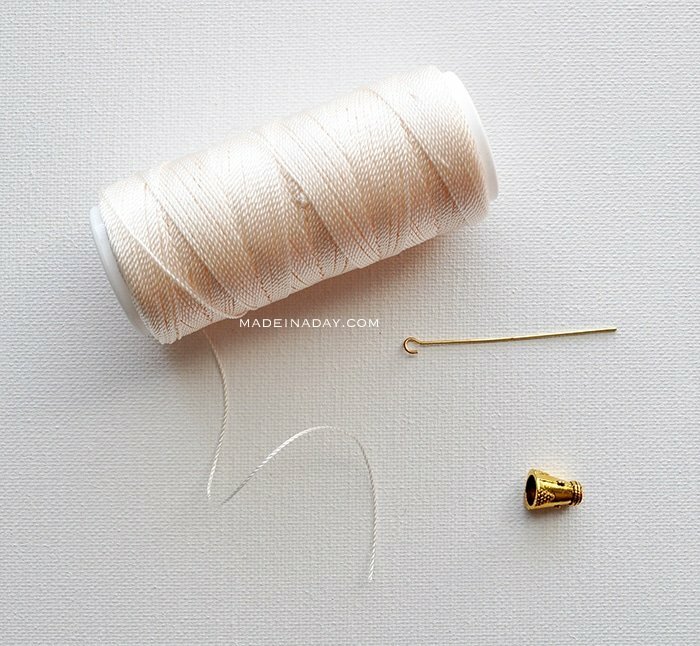 This time I’m going to show you how to make tassels with caps. They are super easy to make and the caps add a little more bling than just a plain old tassel. 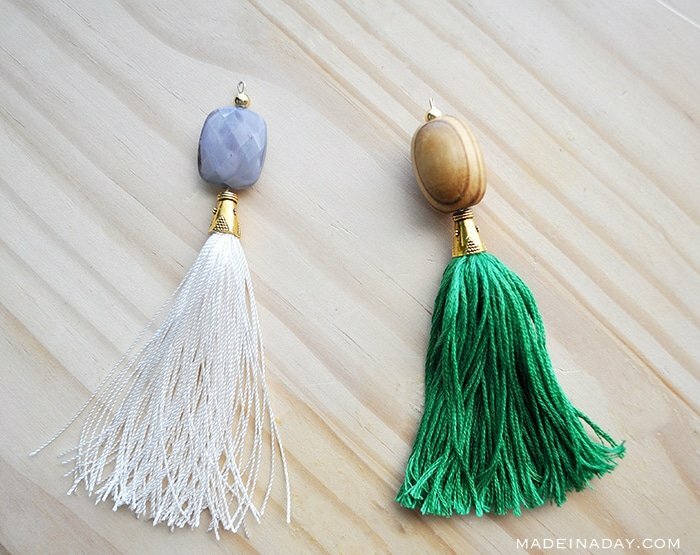 I made these capped tassels for my Buddha Bead Tassel Necklaces. Check out that tutorial for how to add them to the necklaces. NOTE: I apologize in advance for the watermarks of my website URL on these images. For some reason, thieves love to steal these photos for their own tutorials. Watermarking them is the only way to keep the images from getting stolen. 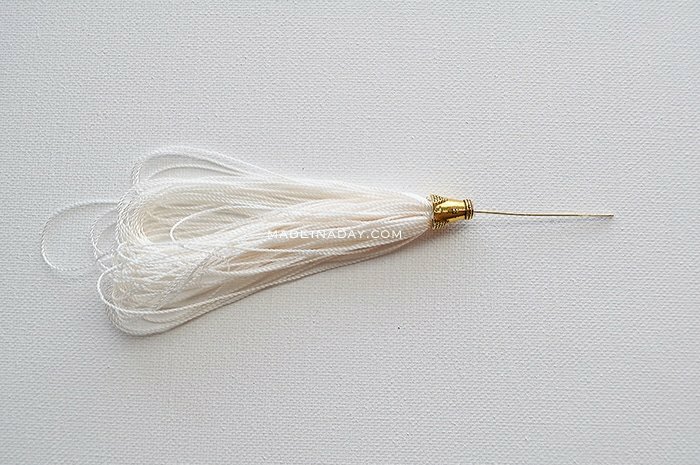 The white tassel I have shown above is made out of Nylon thread. The nylon thread makes a nicer tassel. The thread is loose and doesn’t stick together like the embroidery thread. 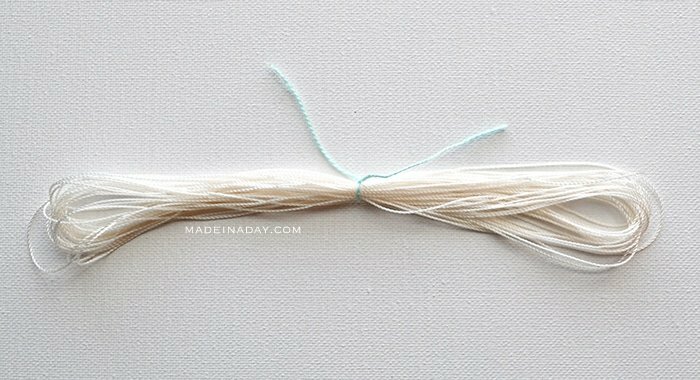 Making tassels with nylon thread will give the tassel that loose shake feel. The green tassel is made from embroidery thread, it still makes a pretty tassel. You just have to comb the thread out to keep the shape. Wrap the nylon string about 15-20 times or more depending on the thickness you want your tassel to be, around a 7-8 inch long piece of cardboard. I actually use a box lid. So fancy right? Carefully slide and remove the string off of the cardboard and tie a piece of thread tightly to the center of the wrapped string. If you are using embroidery string, no need to unwrap the skein from the packaging, just tie a string in the center of the packaged thread. 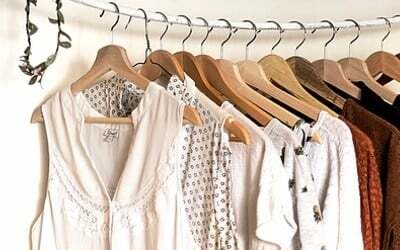 Remove the paper tags on each end and proceed to the next step. Open the hook on the 2-inch eye pin with round nose pliers. Hook it through the string you just tied in the center of the thread. Close the open hook end of the pin with pliers, like shown in the above image. 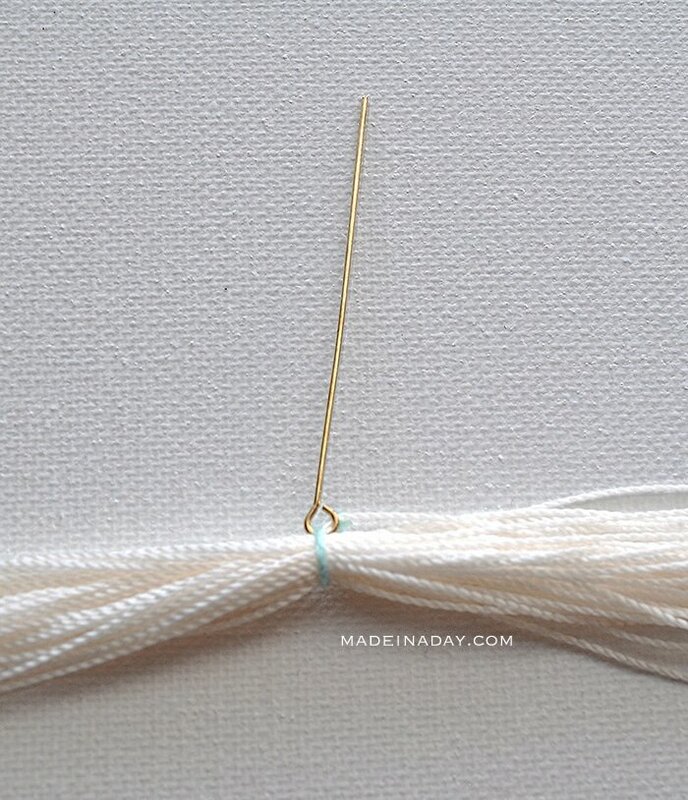 Add a dot of glue to the thread where the hook is looped through the string to secure the knot and hook. Add a dot of E6000 Adhesive inside the cap/cone. Feed the straight end of the eye pin through the cap and pull tightly. You want the top of the tassel as far into the cap as you can get it. Let the E6000 Adhesive dry. Add the bead to the pin. You may need to trim the end of the pin if it is too long. Mine was just right. Grab the tip end of the pin with the round nose pliers and curve it around to make a loop. Make sure the loop end meets the pin. 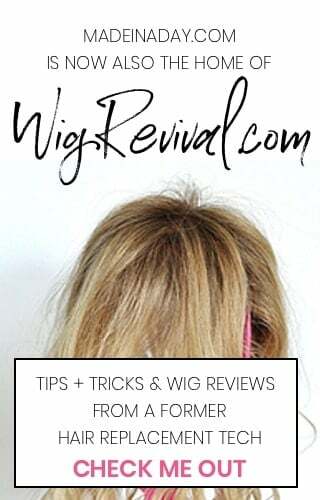 Trim the ends of the tassel and that’s it! You could add these to so many things, necklaces, bracelets and other jewelry. Home decor like pillows, lamp or fan pulls, you name it! THE IMAGES ON THIS SITE ARE COPYRIGHTED. YOU MUST HAVE THE APPROVAL TO FEATURE THEM. FOR MORE INFO SEE MY DISCLOSURE PAGE. If I find my images being used in an unauthorized way, I will report your website to Google Search and Adsense to have it removed. Do you link the sites where you purchase the different pieces to put together these beautiful earrings? Look in the supply list for the links to buy the supplies for the tassels. I was wondering what size caps you used for the tassle? 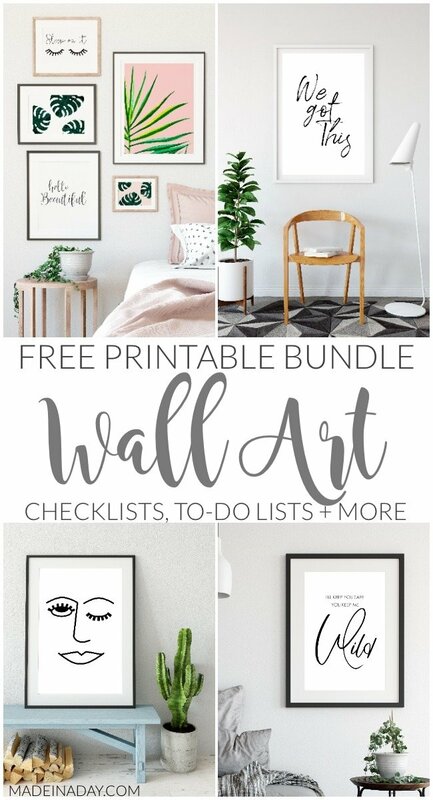 I have only seen the ones shown in this post in one size. You can use any size you want really. It depends on the look of the tassel. I am going to make tassel Xmas ornaments. Red/green & maybe all gold. There are great christmas beads out there also. 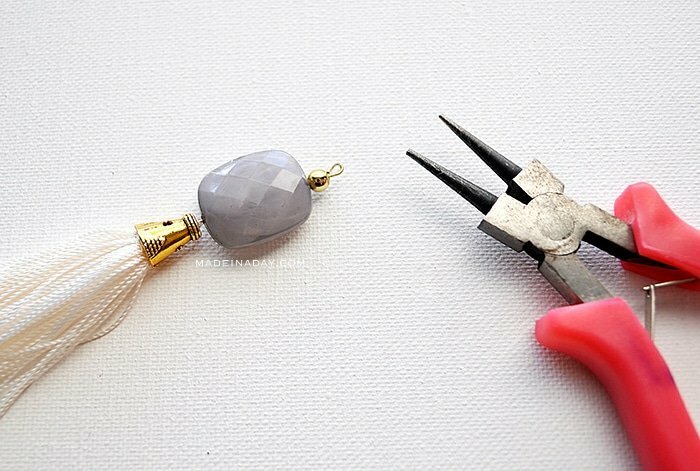 Thank you so much for the tutorial I have been trying to figure out how to attach a tassel to a bead cap and just couldn’t figure it out!!! 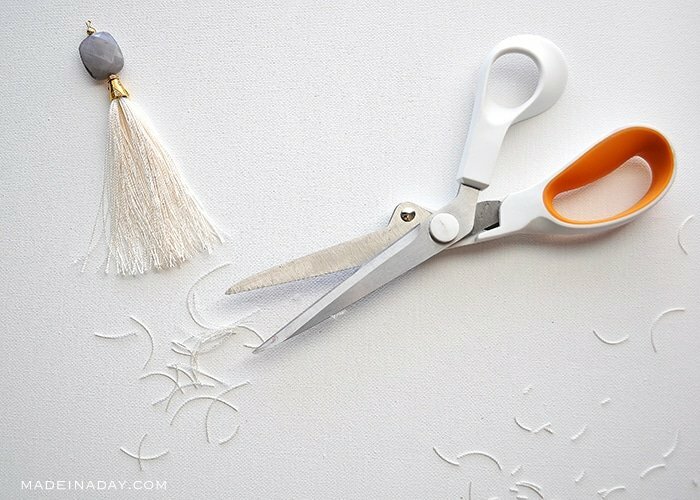 Do you seal the ends of the tassel to keep them from unraveling? No I do not seal the tassels and they have not unraveled yet. I wanted to make some of these for myself and your tutorial is perfect! I can’t wait to get to the shop to pick up supplies. Thank you! These are very smart, thank you i may be making a new kind of bling for my purses, love your post. Thank you. I wasn’t sure what type of thread to use. Great tut. You can do embroidery stitches along the top of the tassel for the braided look. 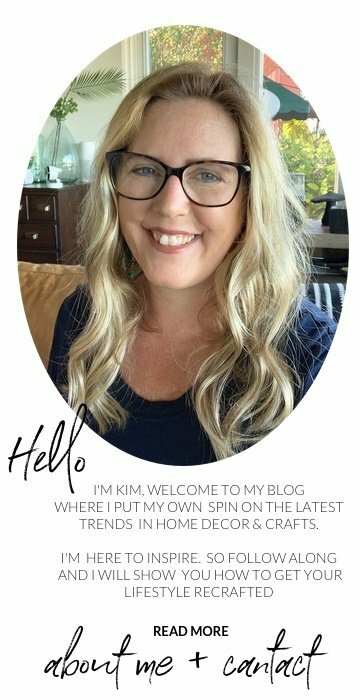 Thank you for the wonderful tutorial, it helped me make some of my new listings in my etsy store! I love these! 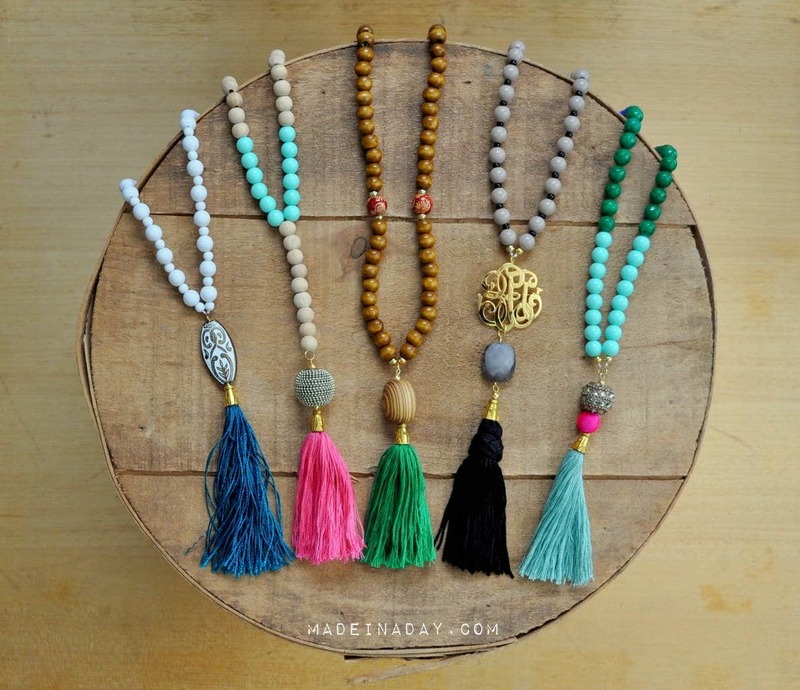 I am obsessed with tassel necklaces! Thanks so much! I am too! Lol. 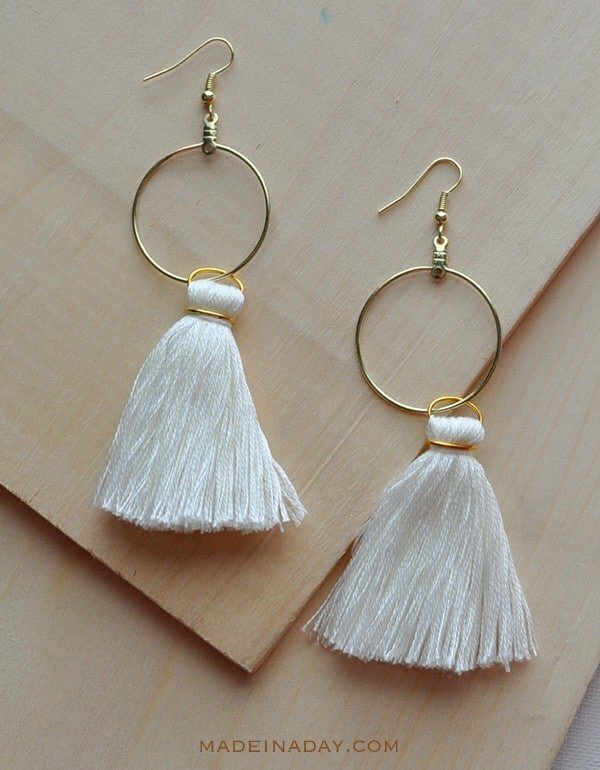 Cute Tassels! 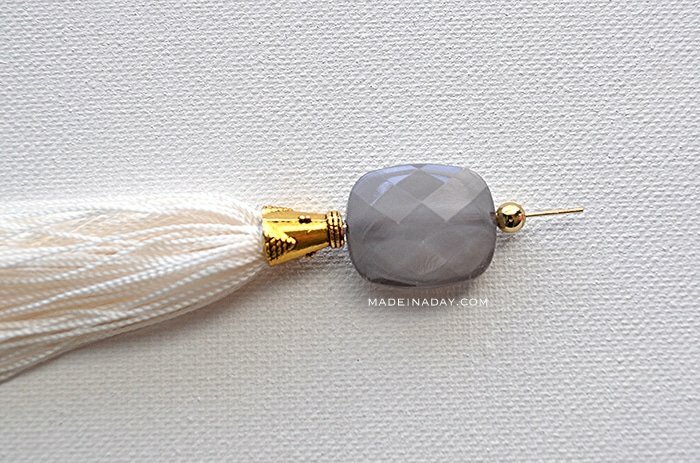 I’d never even thought about making my own tassels, but I love these! Thanks for sharing at On Display Thursday!